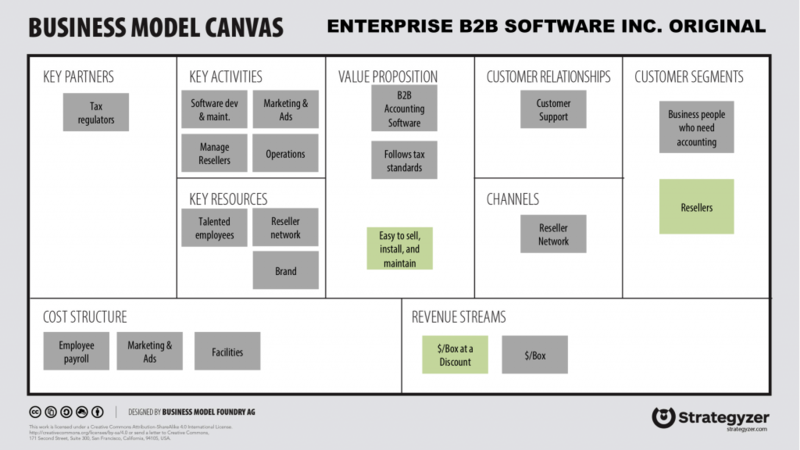 There are many…many ways to use a Business Model Canvas (BMC). Often we see people employ the BMC to better understand how their company creates, delivers, and captures value today. And, just as often it’s used to make an idea (for the future) more concrete. However, in between those two things is ideation. In other words, if you know where you are today and you’re looking for ways to create business models for tomorrow, you must ideate. While there are plenty of really great methodologies and frameworks, like open brainstorming and the Creative Matrix, designed specifically for ideation, the BMC can also be a really powerful tool to get the creative (ideation) juices flowing. The key to using the BMC for ideation is that it’s best to start with your current business model. In other words, if you’re starting from zero, there are probably better methods for ideation. Need a jumpstart to start ideating based on your current business model? Why not use another company’s business model to start your creative engine. This is the purpose of the freshwatching ideation technique. Freshwatching – a made-up term invented in The Netherlands – is an ideation method by which you mix and match (or overlay) business models from other companies, often totally outside of your business or industry, with your own business model to see what you can come up with. For instance, say you’re current business model is one by which you sell accounting software to accountants through an extensive reseller channel to other business (i.e. B2B). 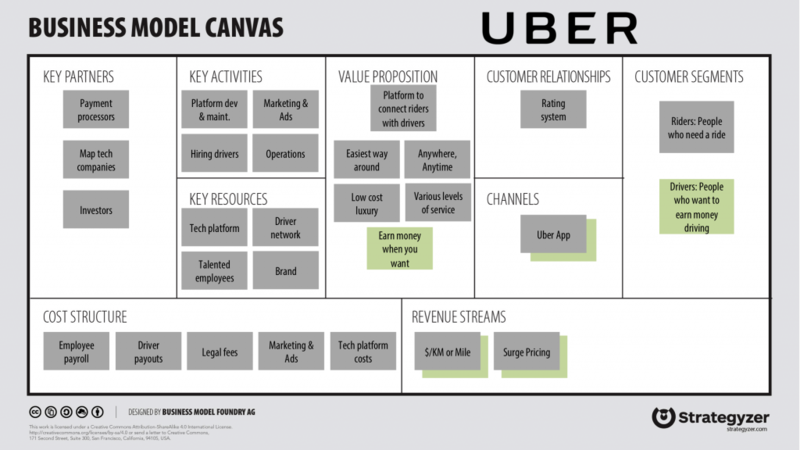 What might happen if you applied Uber’s business model to your own? How would it change things? How would you go about making money in a different way? How would your company change operationally? Freshwatching: what might happen when you overlay Uber’s business model on top of your own? It doesn’t matter if the company is an online business, an offline retailer, or even a massively popular one. With Freshwatching you’re simply looking at your company through the lens of another. Look at your business model, and find the one thing you are absolutely certain is how your company creates, delivers, or captures value (it’s your special sauce). For instance, if you’re running a business wherein you make and sell cars, like BMW, this might be the core value proposition, “The Ultimate Driving Machine®” (i.e. nice, German-engineered cars built for people who love to drive). It could also be an irreplaceable partner or a specific customer segment. 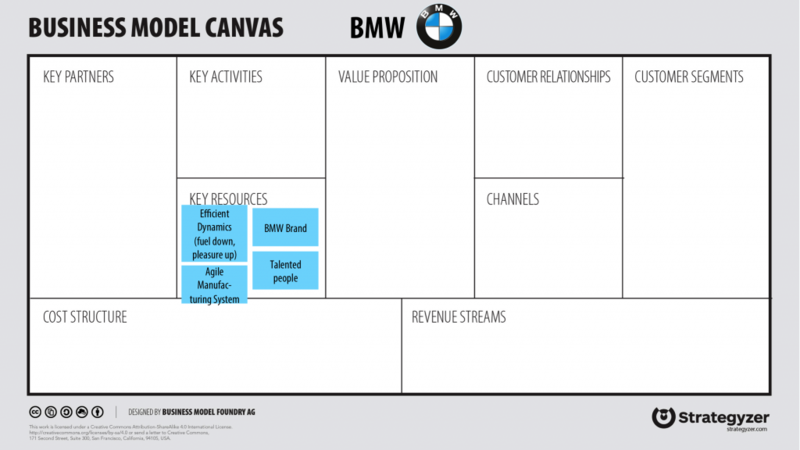 BMW’s current business model: what if you removed its core? Now, remove that sticky note. Chances are your business model now has a big hole in it. Your task: try to fix it. No cheating: don’t sneak the removed sticky note back in! This constraint will definitely give you new ideas. If you’re familiar with the BMC, then you know that this tool represents a dynamic system, whereby there is interplay – cause and effect – between each and every block; changing an element in one block will affect another. This lends itself well a technique called epicenter-based ideation. With epicenter-based ideation, you effectively have nine different boxes, or epicenters, to play with in order to generate more ideas. One way this works is to clear your business model of eight boxes, leaving the focus on one. What would you build if you kept that one? For instance, what if you were able to bring to bear your company’s resources to create an entirely new business model? Amazon did just this when it figured out that it could use its cloud-infrastructure to generate revenue. If again, we were BMW, and we removed everything but the key resources, we might be left with a shiny brand, a pool of really talented people, manufacturing facilities, and perhaps a bunch of IP. Now what? What else could we do with such resources? Epicenter-based innovation: what if we removed everything but BMW’s key resources? Other areas to place focus on using this method might be your customer segments (what else could you offer them); your value proposition (what other customer segments could you address? ); revenue streams (what other ways might you sell, lease, or rent your product/service? ); or even your channels (what else could you leverage your channels to do?). 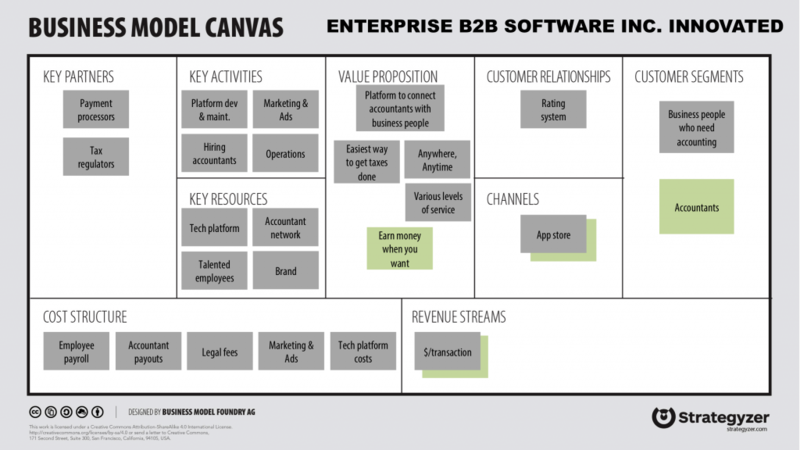 When you scan the landscape of existing business models, one thing you’ll notice is that there exist lots of business model patterns. Business model patterns are like formulas that can be applied to a business model to address a new customer need, or create a new revenue stream, etc. Some well-known examples of business model patterns are ones that use subscription revenue streams and/or have product platforms whereby one part of the product relies on the other to make money (think cheap handles, expensive blades, or cheap printers, expensive ink), often called bait-and-hook. 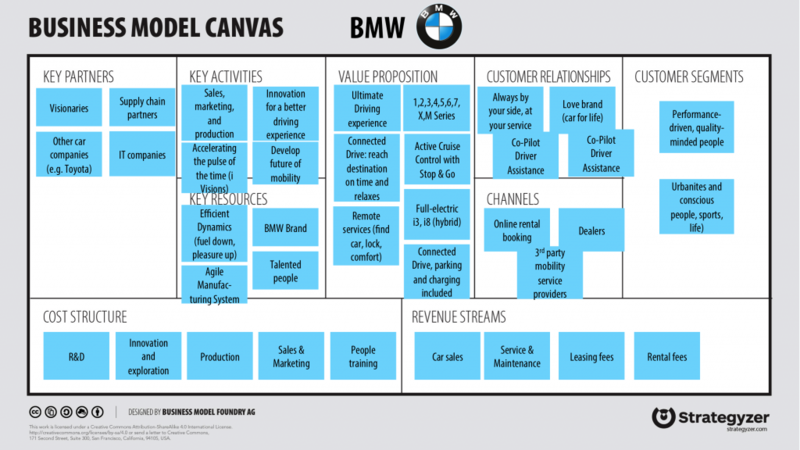 If you’re BMW, how might you apply a bait-and-hook pattern to our business model? Asking “what if?” is a powerful way to help a team come up with great ideas. The key to doing this with the BMC is to come up with a list of questions that challenges what you do today…perhaps for each box of your business model. If, for instance, you’re BMW and you sell your product today through dealers, what would happen if you sold it directly to customers through an online channel? What would that look like? You get the picture. As the trigger questions are asked by a facilitator in 10-15 second intervals (which is important that they are), each person will simply write whatever comes to mind on a sticky note using a permanent marker. By the end of this exercise, there should be a pile of at least as many sticky notes as there are questions in front of each participant. The above ideation (and innovation) techniques are meant to give you concrete starting points for coming up with new ideas. The best way to use these is to do so with a group of people brought together to create novel, new options for your company or product. When ideating always wear a yellow hat. Not necessarily literally. Rather, using Edward De Bono’s “Six Thinking Hats” metaphor, everyone must be optimistic while ideating. Anything is possible at this moment…until it’s invalidated later on in the process. Having a strong facilitator will make all the difference. We all know how hard it is to work on your company while in your company. Bringing in someone from outside your company or even outside your group will help to keep the energy high and the yellow hats on. Use the above techniques as prompts during a workshop. While you might get interesting ideas from people by sending them the prompts ahead of time, more likely everyone will overthink everything. The best way to get people’s creative juices flowing is to have the moderator use these techniques as prompts during a live workshop. Gamify the ideation process. The facilitator should get people to eke out every last idea…to the very last one. A good way to do this is to create a contest out of the ideation process, whereby the person with the most unique ideas on sticky notes wins. Cluster the ideas and apply them to BMCs. Having a bunch of sticky notes with half-baked ideas is…well…not even worth the sticky notes the ideas were written on. To make ideas concrete, cluster all of the ideas into a few bigger categories then have teams of 3-5 people build new business models based on the clusters. What other techniques have you used for business model innovation/ideation? Justin is an experienced strategy designer and MD of the Business Models Inc. San Francisco office. 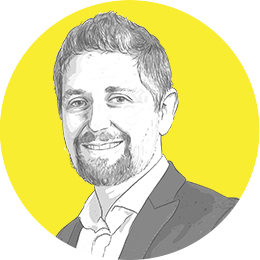 He leverages his experience across a wide range of industry sectors to help companies design innovative, sustainable business models and strategies for the future.